Why is Google+ Hangout so great? Last night, we were able to connect 7 members of our Author's Cave group from all over the world. The voices were clear, not cutting out, and the videos were smooth, not stopping and starting to refresh constantly. Skype - you know who you are! We were also able to share screen so everyone could watch a presentation together - it truly was like being in the same room. I mean seriously, you could pour some wine, grab some cheese and have happy hour with all of your friends, all around the world, without leaving your house or getting out of your pajamas. Okay, now I must admit that I have had some confusion result from my experiences with Hangout, but you know "operator error". Once you understand the process, it becomes very simple and a fantastic way to connect a group of people. 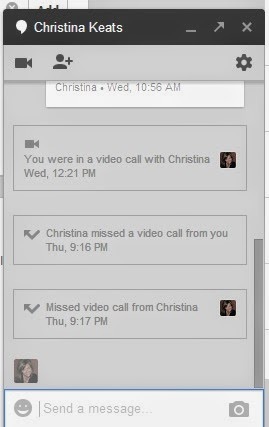 I will do my best to make using Hangouts as easy as possible. What is this Hangout thing and where do I find it? 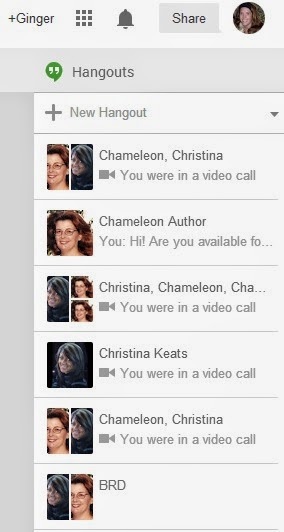 If you are in your Google+ account, you should see this Hangout box on the right, below your menu and profile selector. If you don't have a Google+ account - well...you can only lead a horse to water. This is where you choose whether you want to have a video call or if you just want to instant chat. If you want to call them on video, click the image of the video camera on the top left. It will call them as soon as you click that button. If the person has Google+ open, they will be notified of an incoming video call. They will have the option to join or decline. If you only have Gmail open, then you can initiate a video conference, call or chat in the Hangout box to the bottom left. Where the confusion seems to come, is if you have a lot of folders in your Gmail, it will force this Hangout box down off the screen. 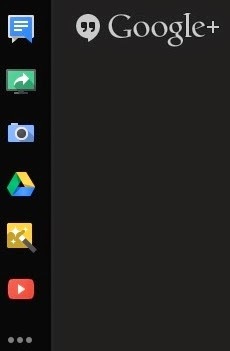 You can click on the black chat icon to open up the Hangout box at any time. Without Google+ open, when a call comes in, you may find yourself hunting all over to find how to answer until you get used it. I think it's easier just to have Google+ open all the time...of course! Another cool thing you may want to do with all of your extra time - yeah right - is to check out the live "Hangouts on Air". Maybe there is something that interests you...maybe not. 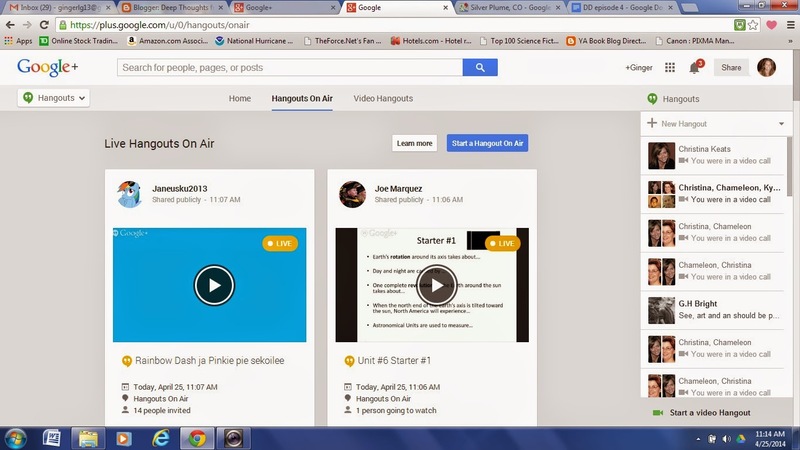 Even better, you can start a live hangout and easily invite people that are in your Google+ circles. If they really like you, or are bored, they can join in and hangout talk about their favorite movie, book or how they hate traffic. 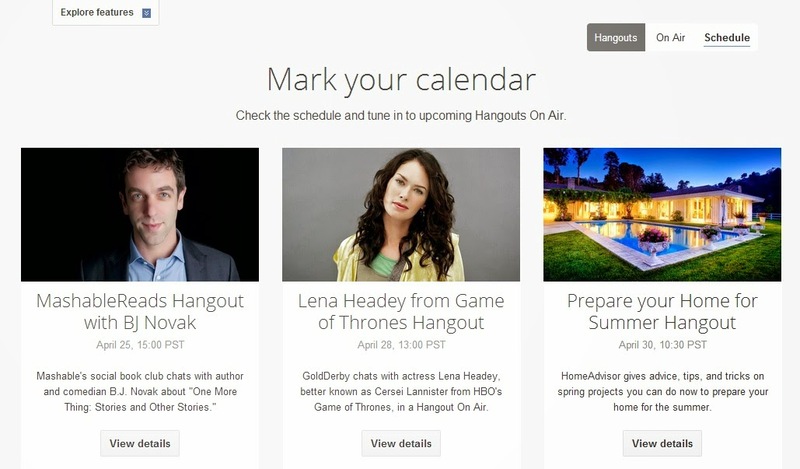 And, if you click Learn More and then click schedule, you can find out about super cool upcoming live hangouts like this one with Lena Headey who plays Sercei on Game of Thrones! April 28! Sorry you missed her. But check it out for future events! Once you are in Hangouts with someone, you can do lots of things. Notice the menu at the top of the screenshot. You will see the following six buttons when you click or hover over the top of the screen. They do disappear if you are not using them. Click the 1st button to invite additional guests. Click the 2nd button to turn your mic on and off mute. Click the 3rd button to turn your video on or off. It will post your profile photo is video is off. Click the 4th button to control the volume. You can also control the volume for your computer separately. Click the 5th button to adjust settings you probably don't need. Integrated webcam and default microphone type stuff. Click the 6th button to hang up the call. Lot's of fun stuff happens here. The top blue chat button opens up a chat box for the group while the Hangout is going on, so you can video and chat at the same time. The green share screen button allows you to share your screen during the call. The blue camera capture button allows you capture images from the Hangout if you want to post later. The Google drive blue, yellow and green triangle allows you to share you Google drive on the screen during the Hangout and also open items that are files in the Google docs. The tan magic wand Effects button is for the crazies like me. You can choose a disguise, hat, glasses all sorts of stuff. The red Youtube button allows you to share your Youtube account on the screen. You can also build a playlist that can be accessible even after the Hangout has ended. That's your Google+ lesson for today. p.s. if you enjoyed this post, please click the g+1 button below here and reshare so that others may enjoy it, too!